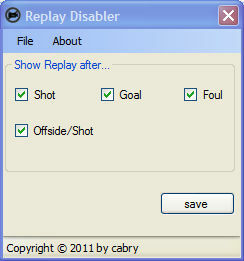 This tool allows you to disable the replays for certain situations in PES 2011.
disable automatic Replay after shot on goal. disable automatic Replay after goal. disable automatic Replay after foul. disable automatic Replay after offside/shot on goal.